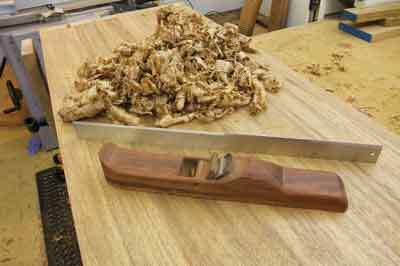 When I started woodworking I struggled to hold work securely for planing and joint cutting. This was partly due to my inexperience, but also to do with the inadequacy of my workbench. The vices I used were subject to wracking and the more I tightened them the worse they got. 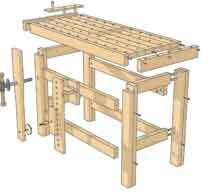 My first proper bench was a version of that made by David Charlesworth, with a central tool well. Made from 3in iroko, this was a real heavyweight and I managed to overcome the wracking vices with a selection of inserts to balance the pressure. In the meantime I had bought a copy of The Workbench Book by Scott Landis which was a revelation and remains today one of my favourite books. 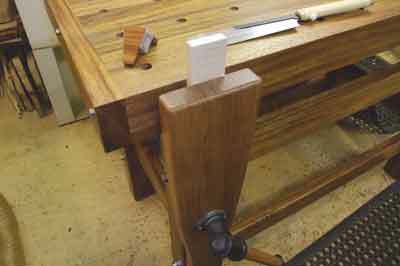 I was drawn towards the old European-Scandinavian-style bench, with a dogleg front vice and a tail vice as advocated by Frank Klaus and Tage Frid. As nobody in the UK appeared to make this style of bench, I decided to buy one from Leif Karlsson in Sweden who is a one-man business making benches in the traditional way. His father made a bench for James Krenov so that was good enough for me. My David Charlesworth-style bench was sold on eBay for a nice profit and the new one has served me very well for the last two years. This bench came about because I needed one to take to the Yandles shows in Somerset at which I sell my own range of hand tools. After consulting The Workbench Book again I decided to build a short but sturdy bench incorporating features from various models that would suit my needs. The main inspiration came from the designs of Roubo and Ian Kirby featured in the book. 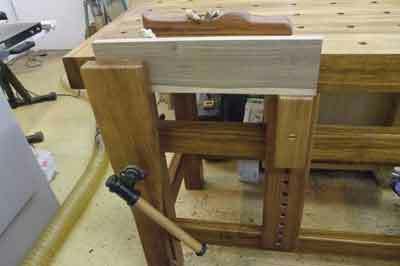 The front vice is an old design which is easy to make and works very well. It has clearance to the screw of 320mm, so is ideal for most dovetailing as well as holding boards for edge jointing. A sliding jack helps support longer boards. 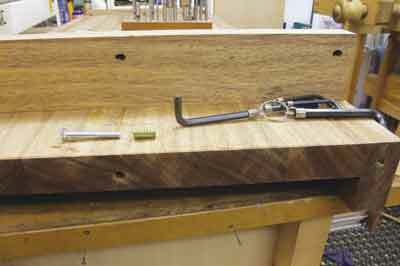 I decided to dispense with a tail vice and simply use a system of stops, which would be suitable for hand planing without pressurising the work. This method is suggested by Robert Ingham and David Charlesworth and was in use at the Barnsley Workshop when I studied there. The grid of holes in the top may offend purists, but it allows multiple stop positions as well as the ability to use Veritas clamps for holding a variety of shapes anywhere on the top. 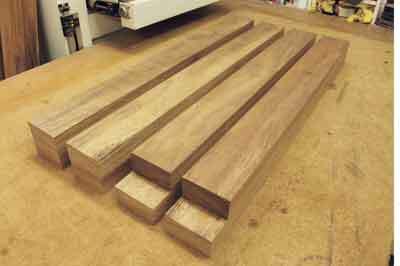 After a visit to a local timber yard I decided to construct my bench from West African albizia (Albizia furruginea), a hard heavy straight-grained timber similar to iroko (Chlorophora excelsa). 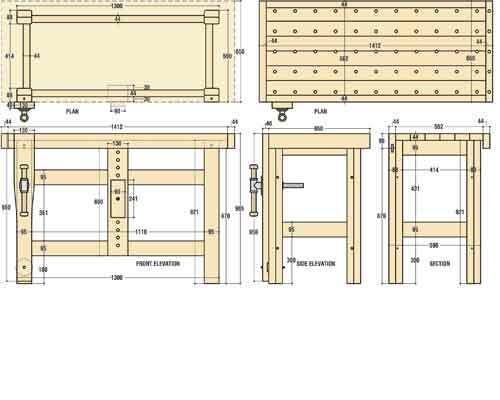 It was available in 3.9m lengths of accurately planed boards measuring 95mm x 44mm (nominal 4 x 2in) and I was able to select to avoid defects and warping. In all I bought 27.3m, as well as another 2.8m in wider stock. The total cost was a very reasonable Â£180 including VAT. I worked out a cutting list and rough cut all the lengths slightly oversize at the timber yard before transporting them back to my workshop where they acclimatised for two months. The top is made from six boards to give a thickness of 44mm, with four more boards giving an apron of 95mm all round, photo 1. I glued these up in pairs, photo 2, to ensure tight joints as well as the flattest possible final surface. Dominos help greatly with alignment and no doubt add some strength, photo 3. The end caps are bolted on using threaded inserts, photo 4. The rear two holes are elongated, allowing for wood movement and keeping the front edge flush. For weight and stability the frame is constructed from the same 95 x 44mm boards. 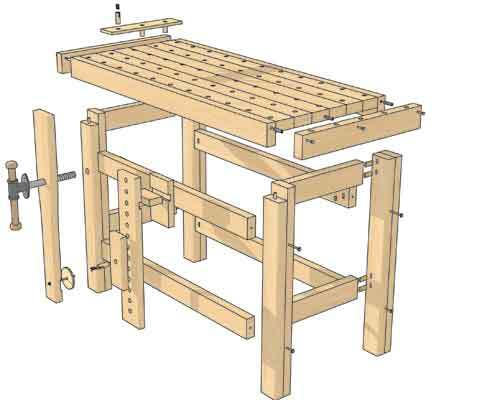 Most commercial workbenches are compromised by the use of flimsy materials for the base. 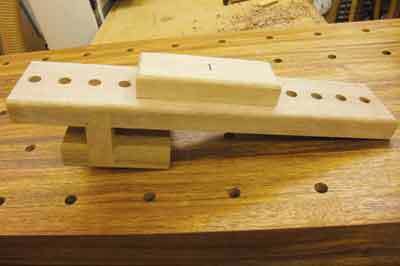 The two end sections are glued up with twin Domino tenons and the rails are attached with threaded bolts for easy disassembly, photo 5. The four legs are made from two boards glued together. This allows the two front legs to be stepped, photo 6, finishing flush with the front apron. 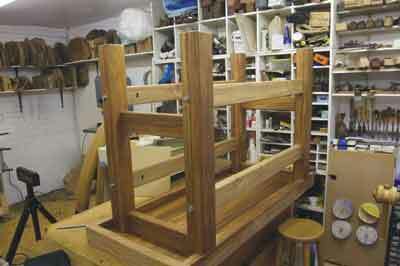 The top is held in place with two 10mm dowels, photo 7, with gravity doing the rest. As with the end caps these are located at the front to maintain alignment with the legs. The leg vice is made from a single board 160mm wide x 40mm thick and is shaped down to 95mm to match the width of the leg. The vice mechanism, photo 8, has two parts, the main screw and the spinner which governs the jaw width adjustment. The vice screw was bought from Axminster Power Tools for Â£17.95 and is screwed to the front of the vice. An oversized hole is drilled through both the vice and the leg, with the large nut being attached to the rear of the leg. The spinner is simply made with 12mm threaded rod attached to the vice with a nut on each side and a corresponding hole drilled through the leg. 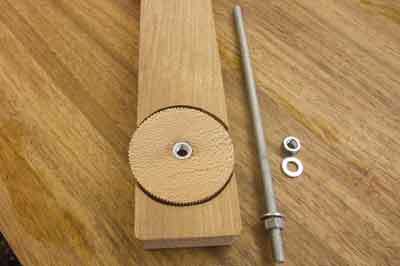 The wheel comprises a 12mm metal nut which is fitted into a circle of stable wood, photo 9, that is slightly wider than the vice to allow easy adjustment. Traditionally this adjustment would have been made with a wooden peg in a series of holes, but the spinner offers infinite adjustment and can be foot operated to save bending down. The care taken assembling the boards for the top means that the top can be flattened quickly with a sharp hand plane, photo 10. 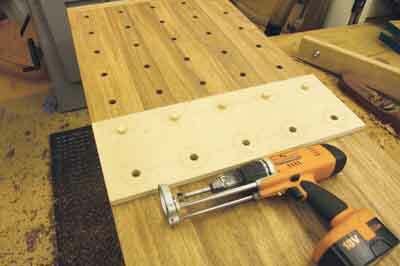 I made a plywood jig on the drill press and to ensure perfect repetition of the hole spacing, placed three-quarter inch dowels in the previous row of holes for the next set to be drilled, photo 11. Using the 90 degree depth stop on the Triton drill helped keep the drill vertical. 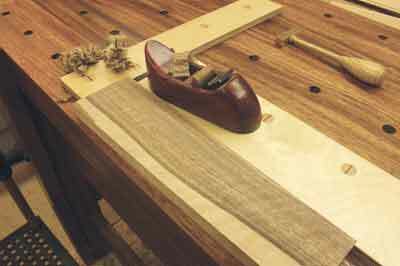 Planing stops are made of 12mm plywood to provide both lengthwise and lateral support when hand planing, photo 12. 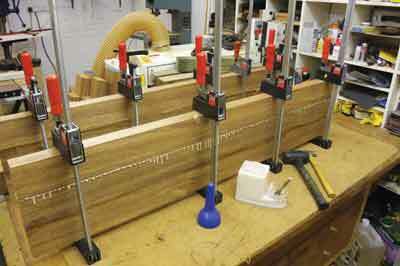 The previously made jig is used to give a good fit. The lateral support has offset holes so that when it is reversed it doubles the number of width options, useful when you need a board to hang over the edge for chamfering or rounding. 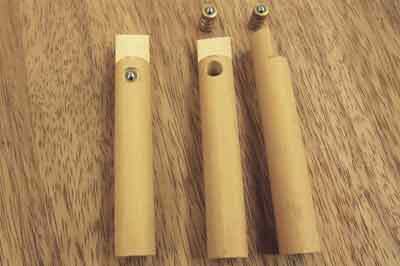 Wooden bench dogs, photo 13, made with Y4in dowel and a ball catch provide good resistance. 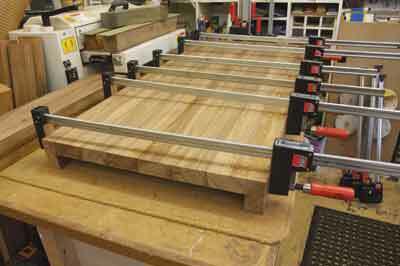 When used with the very useful Veritas Wonder Clamp, boards of all shapes can be clamped anywhere across the surface. 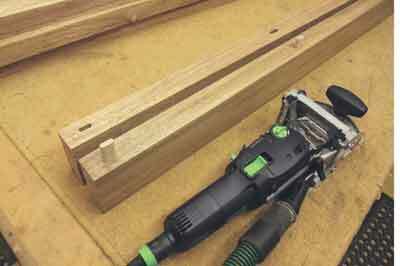 The last holding device to be made is the sliding jack, photo 14, to hold boards for edge jointing. 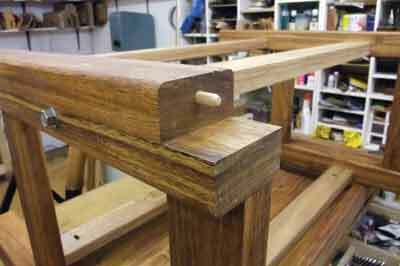 This is made to run along the top rail of the frame and is finished flush with the edge of the top. The holes are accurately drilled at a 10 degree downwards angle with the adjustable support made to match. This angle keeps the support tight in the hole no matter how much downward pressure is applied. The support is made long enough to come within an inch of the bench surface, which saved me having to drill an extra row of holes in the front apron. The 10 degree angle also keeps the support upright, preventing it from twisting when fully inserted. All the holes are chamfered and the whole bench is machine sanded to 180 grit before being finished with three coats of Osmo Hardwax Oil. 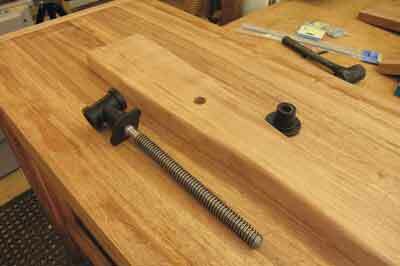 The vice screws are oiled and the rail for the sliding jack is waxed for smooth operation. This bench may have taken 10 years to evolve in my mind, but the actual making was quite quick and easy. It took 28 hours spread over 10 days and the total cost including all hardware was Â£226. It weighs in at about 100kg, so is perhaps not quite as portable as I had intended, but it is rock solid and ideal for demonstrating my planes and tools. So has it turned out to be my perfect bench? Only time will tell.